The device with built-in LED UV bulb + LED Super Bright White Light for verifying UV marks and water marks. Large Window Magnifier up to 5X magnification for verifying micro-printing. The device can also serve as portable light for reading and searching. With 2 x Lithium cells for extra long life. 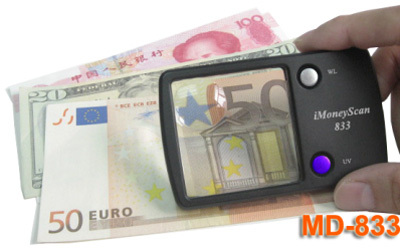 Application : Ideal for travelers wherever money is changed.